Botox and Xeomin are very similar. Xeomin is sometimes described as “The Naked Botox” due to its absence of the carrier proteins present with Botox. In theory this absence of protein carriers results in fewer allergic reactions or resistance to the neurotoxin. Xeomin, due to its lack of these additives, does not need to be refrigerated. 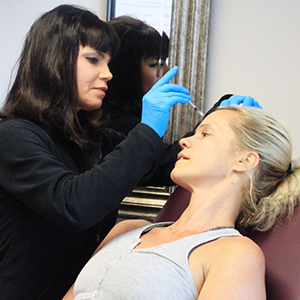 Our experienced Nurse Practitioner and injector will discuss both options with you prior to your treatment. Our terrific Nurse Injectors are available on Tuesdays, Fridays and every other Saturday. Call Omni today to book your appointment – they fill up fast! BOTOX Cosmetic (onabotulinumtoxinA) is the only FDA approved treatment to temporarily improve both moderate to severe frown lines between the brows & crow’s feet in adults over 18 years of age. XEOMIN® is a Botox alternative, contains the same active ingredient as Botox, however it does not contain any additives. 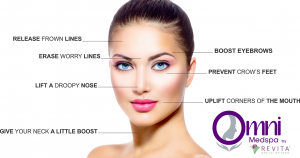 The major benefit of a pure-form injectable is that the human body is less likely to become resistant to Xeomin because there are simply less ingredients in the solution. Some experts have found that Xeomin has the ability to last slightly longer than Botox—Lasts 3-4 months and the effects of Xeomin can be seen sooner in some individuals.